This feature appeared in Rock and Ice issue 249 (April 2018). Only select features from print issues of Rock and Ice appear online. To enjoy the full array of writing and imagery in Rock and Ice subscribe here. Above: Chris Healy cuts loose through the roof of Toadstool (V5) in Super Mario Land. Photo: George Bruce Wilson. Hector Florez, an area developer and well-known local climbing figure, had brought us to one of his new spots, and it was simply too hard to walk through this high-quality boulder field without trying anything. We were exploring the Anasazi Boulders, a three-acre stretch of land off the Santa Clara River just outside of St. George, Utah. The endless undeveloped, hard problems beckoned us. As the heat of the day pressed on, we realized we were barely scratching the surface of this area’s potential. Despite boasting a metropolitan population of 160,000, and a staggering amount of unclimbed rock, St. George has largely been overlooked. Just two hours north of Las Vegas and four hours south of the Wasatch Range, and residing in the shadow of Zion National Park, St. George was traditionally viewed as a pit stop for climbers on their way to loftier destinations. Predominantly sandstone, the boulders tend to be short, overhung and powerful. The better-known St. George areas receive decent traffic, but most climbers come for a day to hit a few classics then move on. New-school climbers such as Hector Florez and Taylor Apple are changing perceptions of this budding climbing hotspot. A “give-back-to-the-community” ethos has sounded a clarion call to establish new problems and has led to the expansion of many of the area’s boulder fields. This growing trend marks a dichotomy between the new- and old-school climbing crowds. For the past two decades most development has fallen to a few local titans and consequently development was meticulous, slow, unpublicized and, in some cases, even forgotten. An enigmatic boulder guide only bolstered the reputation of St. George as just a stopover. The Brazilian climber Rafael Passos works an open project on the Settler of Catan Boulder in Moe's Valley. Photo: George Bruce Wilson. Today, however, scrupulous individuals like Florez wander the desert in the summer heat, reconnoitering the cliff bands and searching for new projects. Development of the Anasazi Boulders, only recently covered in a new guidebook and located just a few minutes northwest of St. George, is a testament to the ingenuity of a younger generation in that development only occurred after a Google Maps search. Largely unknown, underrated and still underdeveloped, this collection of sandstone boulders follows a languorous river and hosts some desperately hard projects. If you can boulder double digits and don’t feel like traveling more than a few minutes from town, the Anasazi Boulders should be first on your tick list. Despite the large number of hard projects at the Anasazis, you don’t need to be a V10 climber to have fun. There are still plenty of easier lines, many yet undone and likely area classics. Furthermore, the array of wildlife and the stunning contrast of the red canyon walls against the almost uncharacteristic greenery mean that the Anasazi Boulders stand out from neighboring areas. However, the lush green comes at a price: the Santa Clara River, which provides water to the canyon, brings extreme humidity making summertime climbing almost impossible. Moe’s Valley, the gem of the area, is east of St. George, and has always been favored for its high number of quality problems and superb, repeatable classics. Hidden from the city in a shallow oval valley, the boulders are scattered along the escarpment of the sloping cliff ledges and are stitched together by thin trails. Smoke stains from Native American fires and small chips of pottery scattered around the bases speak of the area’s ancient human history. 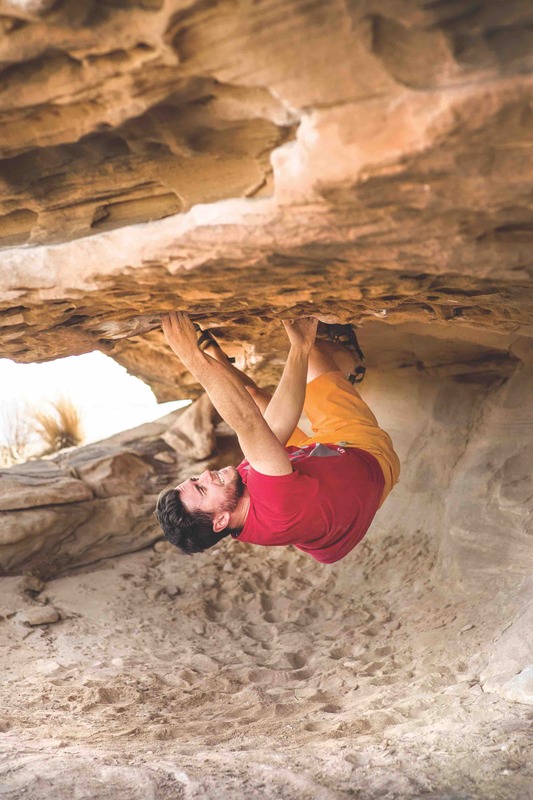 This small valley sports some of the best sandstone climbing in the region, and the stellar rock has made it the area’s most developed and visited bouldering spot. Yet even here new lines are still going up. Less traveled areas in the back of the valley hold untapped boulders, and even popular, well-established sub-areas harbor hidden alcoves and challenging and dynamic lines. In 2009, Moe’s received national attention from the climbing film “The Players” with Daniel Woods praising Moe’s for its quality of climbing. 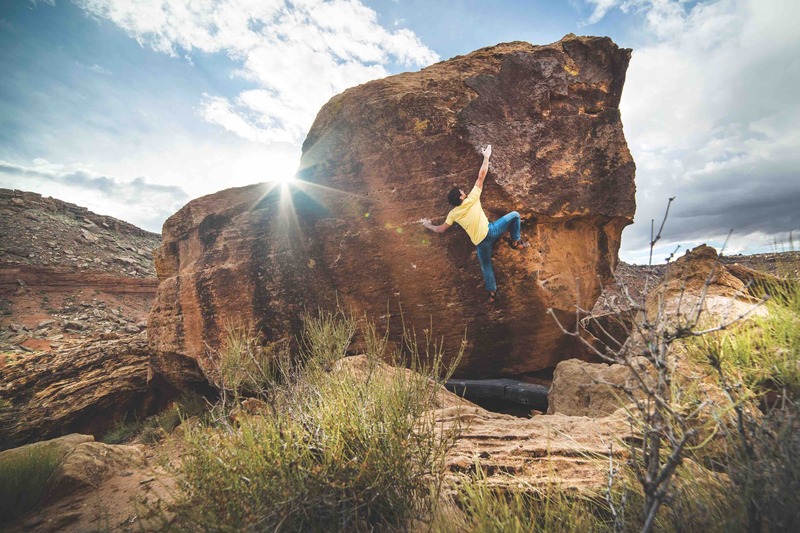 More recently, Isaac Caldiero secured the valley’s first V14, Forces of Nature. Now, a new generation of climbers use the valley to sharpen their skills, and are working to develop new areas. Just less than a mile north of Moe’s is Super Mario Land, one of the few suburbs of Moe’s Valley and another relatively new, burgeoning area. Named for the large toadstool-shaped boulder at its entrance, which hosts Toadstool (V5), the boulder field is a mix of stand-alone boulders and short, plateau walls. A tight-knit climbing crew has climbed a number of new lines but, more importantly, has put great effort toward cleaning the rock and surrounding area of garbage. Northwest of St. George, the undocumented area of Browse offers a beautiful alternative to the region’s typical red sandstone, with granite boulders set against a backdrop of green trees and shrubbery. Browse is higher in elevation than the other climbing spots, providing a welcome climbing option in summer. Garth Rocks is a gradually expanding area to the southwest of town sporting a dirtier and more fragile type of sandstone than Moe’s Valley and requiring stiff cleaning. While the more densely populated portions of Garth are now clean and documented, a good portion of boulders on the perimeter still needs development, and nearly every established boulder has yet more problems to give. Massive cleaning projects have spared this area from becoming trashed; climber trails and well-groomed spaces for boulder pads have replaced piles of debris and car tires. Climbers here work hard to preserve bouldering areas and maintain critical relationships with landowners, and all climbers, whether visitng or local, are expected to follow access restrictions and respect the land. A cautionary tale of failure to do this comes from the nearby Dalton’s Wash area. Some of the main boulders now have fences around them, as much of the rock is on private land. 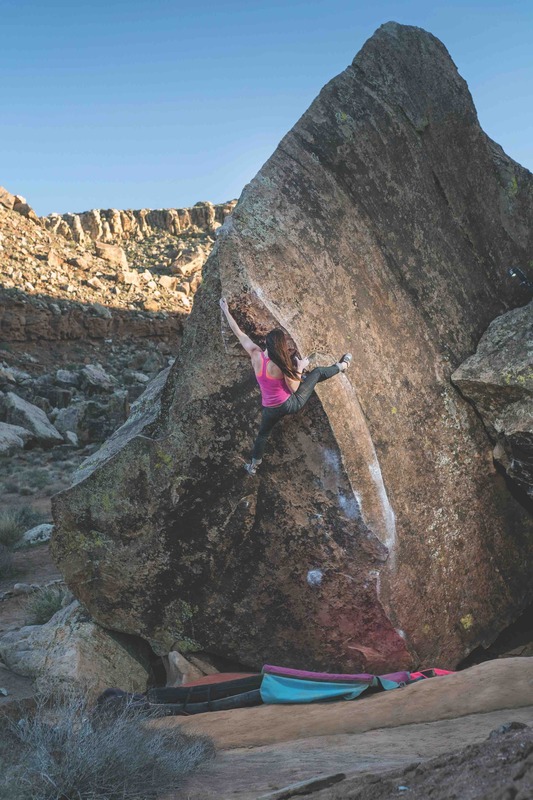 Situations like this lead to many bouldering areas remaining secret and unpublished and serve as a pertinent reminder to respect the land that we climb on and to leave these areas better than we found them. Having passed the hard and crimpy start, Diana Jenson styles the strenuous upper section of Fin Arete (V6), Moe's Valley. Photo: George Bruce Wilson. Most of the land outside town is BLM, so camping is free and easy to find. If you prefer a warm bed, the Knights Inn off St. George Blvd. is budget-friendly. For a more luxurious time, the Green Valley Spa offers nice condos where you can swim and get a massage after a long day of bouldering. Just off St. George Blvd. is a good selection of restaurants. El Coyote has amazing, authentic tacos, Bear Paw almost always has a line for breakfast (worth it), and Benja’s is the preferred choice for Thai food. Smith’s is a quality and affordable grocer located across the street from the Desert Rat, the local climbing shop. All these places are less than five minutes from each other in the downtown area. Zion National Park is an hour east and offers some of the best day hiking around. Canyoneering in Zion is a must-do but requires a permit, which you can obtain the same day at the backcountry desk in the visitors center. You can swim and cliff jump in Sand Hollow Reservoir or, if you want to stay in town, Vernon Worthen Park is a great place to relax and slackline. 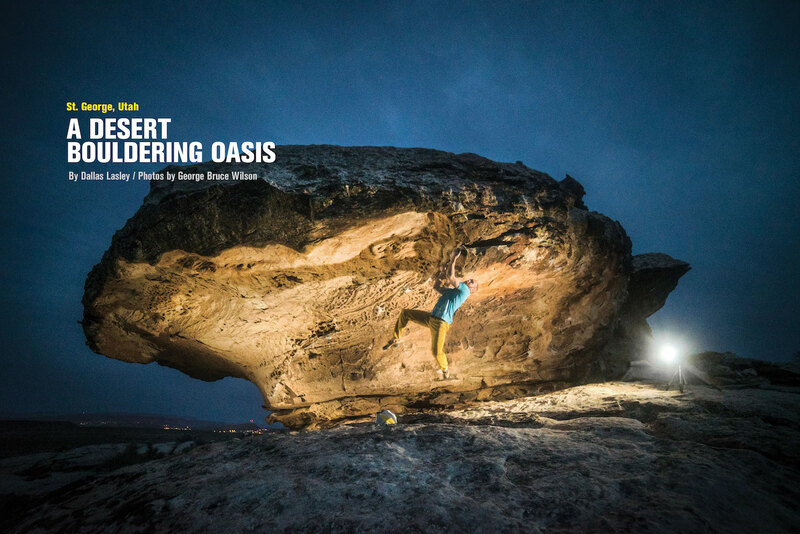 All these problems can be found in the newly released guidebook St. George Bouldering. ACCESS NOTE: Climbers are asked to check and follow access and camping restrictions found online and in the guidebook to ensure that bouldering areas remain open to all. Dallas Lasley has been pulling on rock in southern Utah for the past five years, and is an RN in a shock/trauam ICU in Salt Lake City.